Played some more this weekend at Concord Round 1 and Castro Valley Golfland. Just mostly finishing up story mode to tune some cars and doing some ghost battles. 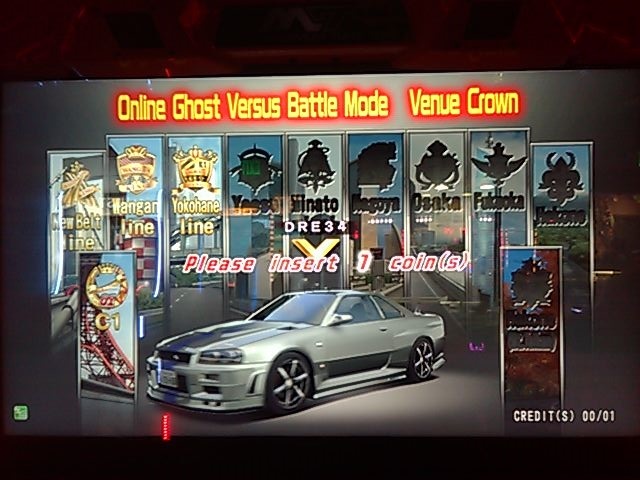 Took a few crowns at Golfland with my R34. Didnt have enough time to take the rest. yeah, my patience isnt that great for story mode grinding. 20-30 races np, 40 no thanks; 60 n ty. it usually takes 3-4 visits for me to FT a car. though there were more than a few locations that were quiet enough to get some good potential progress. if i spend +4hrs doing same thing it does get a bit boring doing the same thing but i also do get those times where you are so frustratingly close to your goal that i MUST achieve it in that session. the most i ever spent in 1 arcade session was $40, $20-30 is the usual amount i spend on any given day though if its too busy $15 is sufficient if its peak usage for the machines. though would it even work to have a JPN car mixed onto a banana pass with other ENG cars? i only ever played ENG versions before so cross compatibility is a bit confusing to me ATM. anyways using my main cards in JPN MT6 is a non starter. there are around 1:2 ratio for arcades to 7/11 in Japan as far as distribution. im not sure about USA or other countries but the arcades have mostly died off around a decade ago in the areas im around ie Montreal Canada. there are only a handful of arcades few and far between and none have gone past MT5. there are some more retro ones that rarely if ever update the game selection. the one i go to locally keeps up most of the time but i dont think we'll ever get MT5DX, its more likely it'll jump to MT6 when its deemed time to do so. getting a 3rd card that i can update to MT6 in Japan is fine but i cant do that to my main MT5 cards locally. it would isolate them in a version whose arrival is TBD at the very least. i do plan on going back to Japan again and i'll probably just go and get a 3rd card, bang out a FT car and save it for the next trip. the JCESE isnt the best car for me but i still like it alot and its a god damned tank . EDIT: so i made a new card today, used 3 of my discards from my main card. put a R33 and JCESE on the card and left the 3rd discard open. got the R33 to story stage 40/700HP from a 600 hp car, got the JCESE to 620HP. will FT both of the cars then let the card sit around for a while, no sense in doing any body kits or wheels if its gonna be lost when it transfers to MT6 when i can do so. MT6 might even be a year away at minimum locally at this point. hopefully they put the EVO7 into MT6 so i can use it when the time comes. yeah thats a game that was close to my heart though it was stopped at AS4 in Canada. then i moved onto MT5. i still love to play IDv2-3 on the very few cabs that do remain locally. unfortunatley in the brief time i was there there werent many players on the cabs to VS, i did VS a newb and won 3 games but none with cards. i did visit the arcades midday but its the evening where you'd see more people there. i do hope to visit Mikado game center on my next visit, saw it on YT and they might still have Soul calibur 2-3 there. none of those i came by in my trip had it but had even older games in stock.